What Pokémon can learn fire type moves and have very high Attack or Sp. Attack! So is this like a mix? Chandelure has a very high Base Sp. Atk. 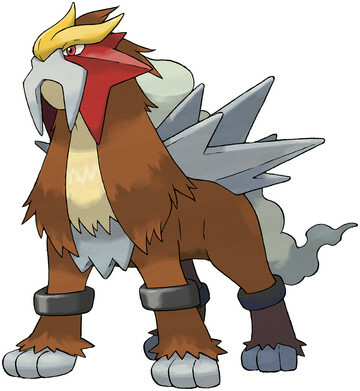 Bite on Entei? Why? Sacred Fire - Bulldoze - Stone Edge - Flare Blitz/Flame Charge. Also Houndoom should be mixed with Sucker Punch or full Nasty Plot special. That set is kinda weird and not all that viable. In their defence, Mega Houndoom can plausibly run Solar Beam on a Sun team. The thing with Volcarona is that it is not very powerful without Quiver Dance which is a set up move.. Its to risky for to setup in this fight i going up againist. What fighting type Pokemon have a higher sp. atk than attack? Should I teach surf to my Palkia? (he has very high sp.attack)? What Pokemon from Unova have the most attack, def and SP def and SP attack? What is the fastest Fire Type Pokemon with the Highest Attack? There's a way to counter the Sp. Attack loss of Overheat? Which Mega - Evolved Pokemon have the overall highest Sp. Attack? Why do most sweepers have a randomly high special attack?